Holbein Vernet Superior Oil Color combines modern technology with the finest pigments. The line, made up of 40 traditional colors, utilizes pure single pigments and the finest quality refined linseed oil. Because pure single pigments are used they produce clean, non-muddy results when mixed. Vernet Oil Colors also offer superior adhesion, tinting strength, durability, smooth texture and excellent lightfast ratings with high chroma, transparency and pigment density. With strong, beautiful and stable colors; Vernet offers the modern oil painter the most advanced and highest quality oil color range ever produced. 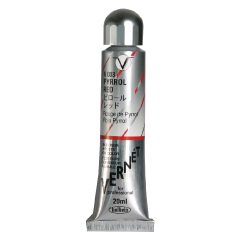 Each Vernet Oil Color is packed with pigments making them concentrated enough that a 20ml tube goes a long way! Find Vernet Superior Oil Colors here! See the Vernet Color Chart here!